Please join us for the first-ever Learn@DLF! To cultivate creative training and professional development opportunities stemming from our past three successful DLF Forum Pre-Conferences, we are excited to host Learn@DLF on Sunday, October 14. Thirteen workshops on a variety of subjects are being brought to Learn@DLF by teachers and facilitators from the DLF community. Five tracks will be going throughout the day, but feel free to mix and match. Workshops are either 5 hours, 3 hours, or 2 hours in length. 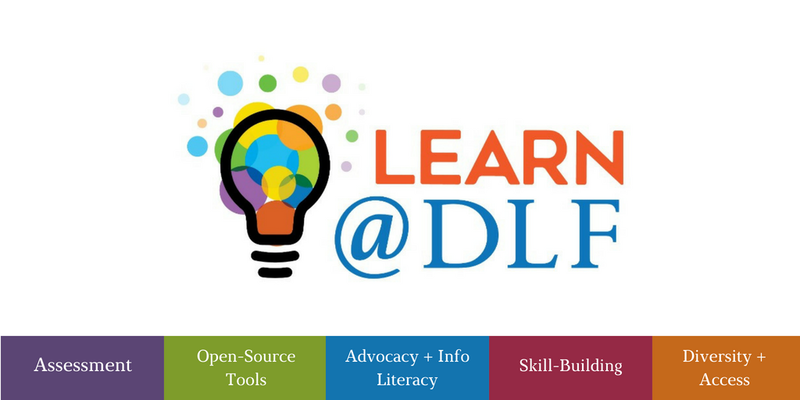 View the Learn@DLF 2018 schedule. Add Learn@DLF to your ticket when you register for the Forum and/or Digital Preservation 2018. If you would like to sign up but have already registered, please contact us at forum@diglib.org with your workshop choices! Attendance of Learn@DLF is welcome regardless of attendance at the DLF Forum. Thank you to our planning committee members! The 2018 DLF Forum and Learn@DLF are community and practitioner-based events that would not be possible without thoughtful and engaged participation from our community. Thank you! So, no Liberal Arts Pre-Conference this year? In 2015, coinciding with a mission refinement for DLF, we hosted our first Liberal Arts Colleges Pre-Conference. This was meant to foster conversation, build community, and serve as a kind of “on-ramp” for our newest type of member organization—the liberal arts colleges that had become a sudden, positive presence in DLF. We ran another LAC Pre-Conference in 2016, bringing student-centered archival issues to the fore with an important keynote by Jarrett Drake. From the conversations, ideas, and circumstances of the 2016 Pre-Conference and election-year Forum, we issued an open invitation to the community, to use the DLF as a platform and a framework for action. It was in that spirit that DLF partnered with the HBCU Library Alliance for a 2017 LACs-HBCUs Pre-Conference focusing on digital pedagogy and career pathways for students and LIS professionals from under-represented groups. Almost all 2015-17 pre-conference participants have stayed on for the Forum itself, and many have started or joined working groups and become active members of the DLF community, changing our conversations for the better. On-ramps work! But intentional work toward inclusion and integration of perspectives in our main event seems even better. Meanwhile, the Forum has been growing, and demand to offer and participate in workshop-style sessions has grown with it. There’s no longer space for as many hands-on and multiple-hour sessions as we would like. Enter Learn@DLF. We’ll be looking to the community to help us make sure there’s something for everyone there, no matter where you work or what your professional role may be! Gosh, 'Learn@DLF' is a catchy name. Maybe you should do something even bigger with it.